When I first came in for the iScan™ assessment, I quickly saw that the places I had always felt were in trouble lit up with the signal display. That was very reassuring. The scan was showing what I knew about my pain and injuries. But I was amazed to see the signal information pointing out places of which I was not aware, too. They were locations of old injuries and infections that I was able to recall and it made a lot of sense about why my problems had been so chronic and puzzling. It was great to watch the scan show less areas involved as I progressed through my program. That was reassuring too! – H.P. SonotectTM is a new biophysical diagnostic technology provided by our clinic as an assessment system. 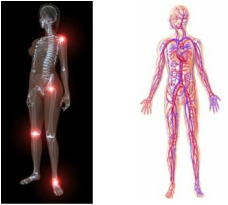 This noninvasive acoustic-based scan provides measurements that are used by our therapists to detect anatomical locations that are key to pain, inflammation, and other physical problems. Their abnormal status produces sonodetection signals that our system captures, analyzes and displays for clinical use. Our excellent treatment results are supported by this valuable guide. Further, we can monitor progress through these measurements. From one session to the next and throughout an individual’s journey to recovery, we can objectively verify improvement, and resolution. iScan™ keeps everyone well informed about response and achievements of our program. The QRI (R) Stress Mapping technology helps us detect, identify and solve problems that have been “invisible” to other efforts. Our experience has been very promising. Upcoming third party research should establish Sonotect as the next major diagnosis method in medicine. 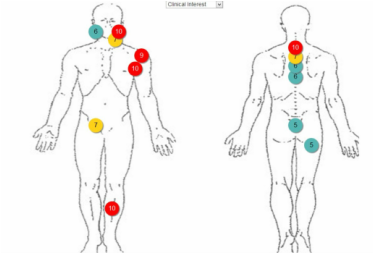 It is the first system to report the status of the body tissues. The iScan™ can help the clinician to determine if a body site is normal or abnormal in relation to understanding how to help it recover. It provides information about the mechanics of the tissue, properties which are fundamental to how the tissue functions and feels. iScanTM detects persistent pain from injury and guides therapy to be applied in the right location for the best results.